Awhile back, I wrote a post here about our Makerspace program. Since we are nearing the end of the year, I thought I would write an update of where we are at and a little about what I’ve learned along the way. First of all, our ES Makerspace has passed budget approval and we are doing some major renovation of the space which I am currently in (formally an ES Tech lab). During the summer months here, we will give the room a facelift. This took an enormous amount of research and work. Since I’m not an architect or a builder, I found it challenging to make decisions on so many little details about the room. I had lots of input and support from my admin and teachers who gave me feedback along the way. I also had meetings with our Operations Director, IT Manger and Builders. After thinking carefully about the functionality of the room, I think we have a near final plan. I used a 3D modelling program to create this and you can see it here (click the 3D tab on the right to move around the space). The benches and other side tables will be on wheels so they can be moved around when needed. The side storage room is a bigger storage room for all school science and engineering kits and materials. Other than that, we held our first Family Maker Day which was a big hit (but a ton of work!). We had 100 students come with their parents and had 14 different stations that they could freely engage in (I think I’ll do a separate post for this). Anyway, back to tech stuff. 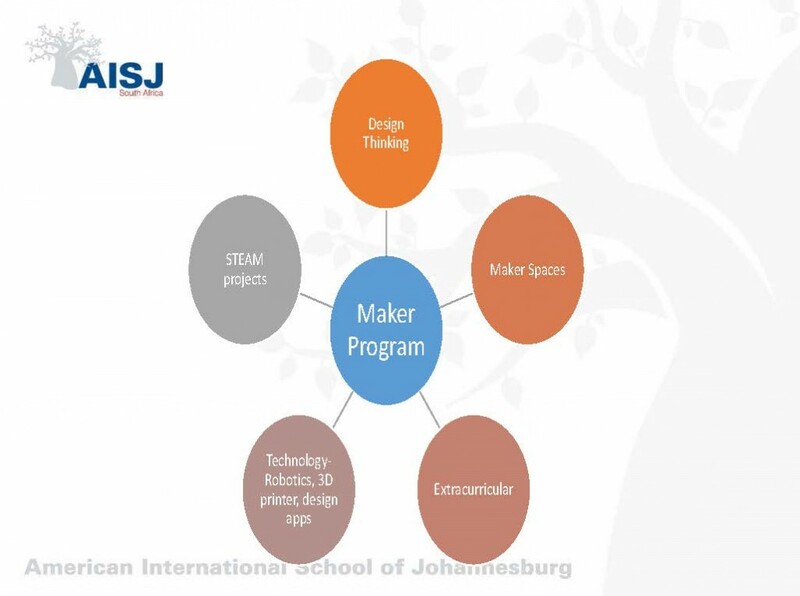 One exciting initiative I’ve started at our school is creating a Maker Program in ES. It’s been an incredible journey so far and by no means, do I feel like we are there but we are well on our way. 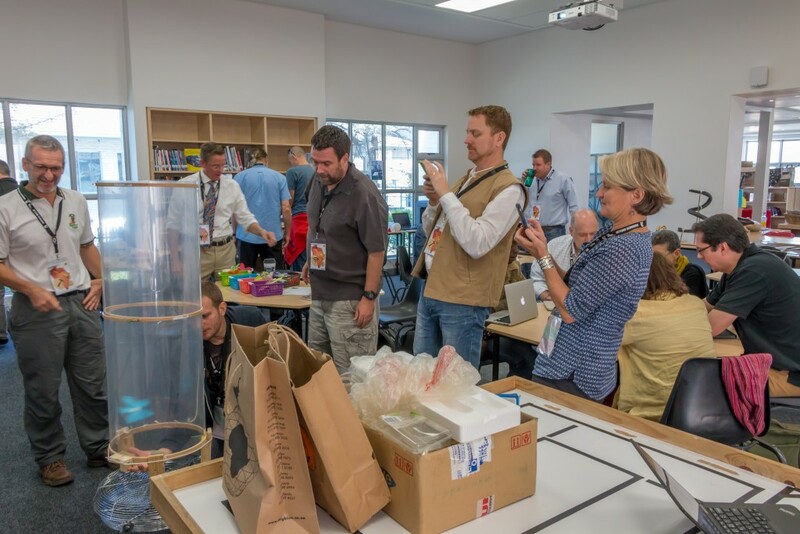 I recently co-led a “Making” preconference in November as our school hosted the Learning2africa conference. This workshop took a ton of work but thought it went very well and we had almost 25 participants. For those of you interested, here’s a link to the powerpoint. After some theory, we had a group challenge where participants had to create a device that would hover in a homemade wind tunnel and used the Design Cycle to create their devices. We also provided a number of breakout sessions on 3D printing, robotics, programming and arduinos. 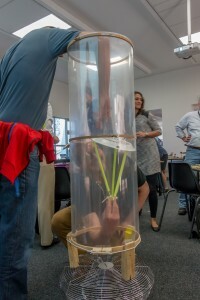 This workshop was a nice way to share where we were as a school in terms of our Maker program journey but also to network with other colleagues from around the world. Things have actually progressed quite a bit since this. Ordered tons of new resources to expand the program! 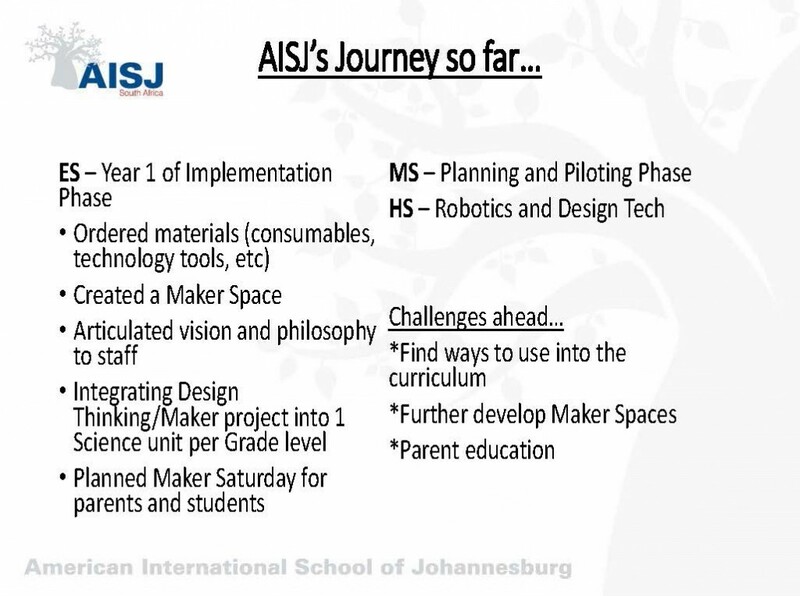 Design Thinking in ES from AISJ on Vimeo.